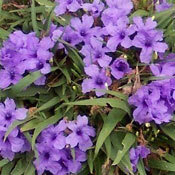 Ruellia (pronounced roo-EL-ee-uh) bears trumpet-shaped, nectar-filled blossoms that are also highly attractive to hummingbirds, butterflies and bees. It is most commonly called the Wild Petunia, but is also known as the Mexican Petunia. 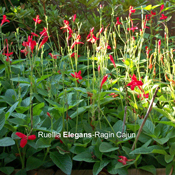 All our Ruellia Plants for sale are shipped with very well-established root systems. We guarantee them to arrive alive and thriving.